Cardiac Rehab patients are seen at 9 a.m., 11 a.m., or 1 p.m. every Tuesday and Thursday. Pulmonary Rehab is a program that teaches patients with lung disease how to obtain an improved level of health and fitness. This is achieved by combining education, breathing retraining, energy conservation and monitored exercise in a comprehensive approach to caring and managing chronic lung disease. Participation in Pulmonary Rehab enables patients to increase their physical activity conditioning and exercise tolerance, thus minimizing shortness of breath with daily activities. Let us help you live, learn and breath better with lung disease. Pulmonary Rehab patients are seen at 10 a.m. or 2 p.m. every Tuesday or Thursday. For information or to make an appointment, phone us at (541) 247-3060. 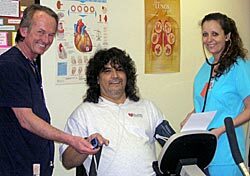 Physician referrals are required for Cardio Pulmonary Rehabilitation services.